US District Court Judge Joseph L. Tauro inside his chambers at the Moakley Courthouse.Judge Joseph L. Tauro on a tour of the state hospital in Danvers in 1979. His decisions became national models. Six months after being sworn in as a US District Court judge, Joseph L. Tauro hopped in his sports car and drove 90 miles west from his Boston courthouse to pay an unannounced visit to a state school for the developmentally disabled. A lawsuit had alleged unsanitary conditions, but he was unprepared for what he found. That visit led to the first landmark ruling by the jurist, who would go on to serve as chief judge of the US District Court in Boston from 1992 to 1999. Judge Tauro was 87 when he died of myelofibrosis Friday in his Marblehead home, and his passing was mourned throughout the judiciary. “The bench has lost a terrific colleague, the bar has lost a remarkable mentor, and I have lost a truly great friend,’’ said Stephen Breyer, a US Supreme Court associate justice. Presiding for two decades over the Belchertown case and its offshoots, Judge Tauro issued rulings that forced the state to spend millions more to care for the developmentally disabled and to create lifetime individual treatment plans for patients. Judge Tauro “became a giant of the bench in pursuing justice for these children and people who have fewer rights in our society,’’ said Patti B. Saris, chief judge of the US District Court in Boston. In a career on the Boston federal court bench that had lasted a record 41 years when he switched to senior status in 2013, Judge Tauro crafted decisions that created national models not only for the care of the developmentally disabled, but also for the rights of the mentally ill to refuse unnecessary medication and avoid solitary confinement except in emergency situations. Judge Tauro’s ruling protecting the mentally ill established what are known as “Rogers orders,’’ after Ruby Rogers, the lead plaintiff in a 1970s lawsuit. “Whatever powers the Constitution has granted our government, involuntary mind control is not one of them, absent extraordinary circumstance,’’ he wrote in his decision. “Many of his decisions reflect the kind of compassion and empathy that I would say he displayed personally as well as professionally,’’ Mark Wolf, a senior US District Court judge, said in an interview. Only 40 when President Richard Nixon nominated him to serve on the federal bench, Judge Tauro was comparatively young when he established his national reputation and legacy a few months later. In 1973, Judge Tauro first toured the Belchertown facility with Benjamin Ricci, a college professor whose son was at the school. Before letting the judge leave, Ricci brought him to a remote part of the grounds “where there was a graveyard that had no gravestones, just plugs on the ground with numbers on it,’’ Judge Tauro recalled in a 2006 Globe interview. An only child, Joseph Louis Tauro was born in 1931 and grew up in Malden and in Swampscott. His mother, Helen Petrossi, had trained as a court stenographer. His father, G. Joseph Tauro, served as chief justice of the state Supreme Judicial Court and chief justice of the state Superior Court. Judge Tauro’s keen awareness of injustice was formed partly during his Malden childhood. “There was a lot of name calling — ‘dago,’ ‘wop,’ ‘guinea,’ and some fights. I didn’t like any of it and that may be why I am so sensitive today with respect to bigotry of any sort against anyone,’’ he was quoted as saying in “Benchmarks XXIV: The Life and Legacy of Joseph L. Tauro,’’ a 2011 book by Richard Belin. 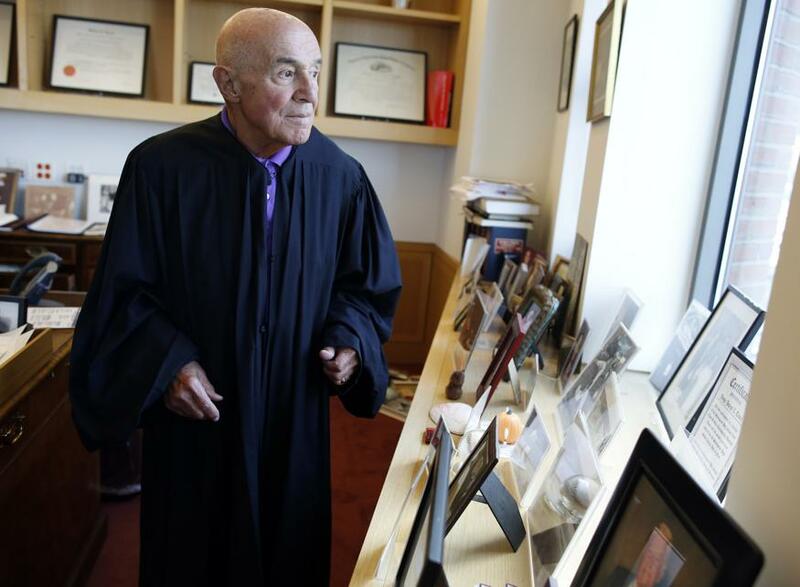 Judge Tauro was an avid baseball player at Swampscott High School and at Brown University, from which he graduated in 1953, and where he also broke his nose playing goalie for the soccer team. After finishing Cornell Law School in 1956 and passing the Massachusetts bar exam, he served in the Army for two years as a lieutenant. For a time, he was the launching control officer at the Nike guided missile site in Virginia. After returning to Massachusetts, he served as an assistant US attorney in the early 1960s and as chief counsel to Governor John A. Volpe. He was appointed US attorney in Massachusetts in early 1972 and was only a few months into that job when Nixon nominated him to become a federal judge. Judge Tauro was first married to Elizabeth Quinlan, and they had three children. She died in 1978. In addition to his wife, Judge Tauro leaves his three children, Joseph Jr. of Nahant, and Beth and Christopher, both of Marblehead, along with six grandchildren. The family is planning a private military graveside service. Judge Tauro often wore a judicial robe that had belonged to his father and took pride in noting their unusual status as father-and-son chief judges of state and federal courts. The judge, however, told Brown Alumni Magazine in 2015 that he thought he took a “moderate’’ approach to all cases. Bryan Marquard can be reached at bryan.marquard@ globe.com.